There have been some no-knead yeast bread recipes circulating lately. You may have seen them- some are being baked in mixing bowls. People are excited when they discover that they can have fresh-baked yeast bread without the time or trouble of traditional yeast bread recipes. These recipes make me think of my older sister. She was always the cool one (and still is!). In the early 1970s, she was the Cool Big Sister who went away to college and came back at Christmas break wearing purple velvet bell bottoms and listening to Steppenwolf and Led Zeppelin. Later, she was the Earth Mother, raising her beautiful son on health food and working at the local vegetarian restaurant. 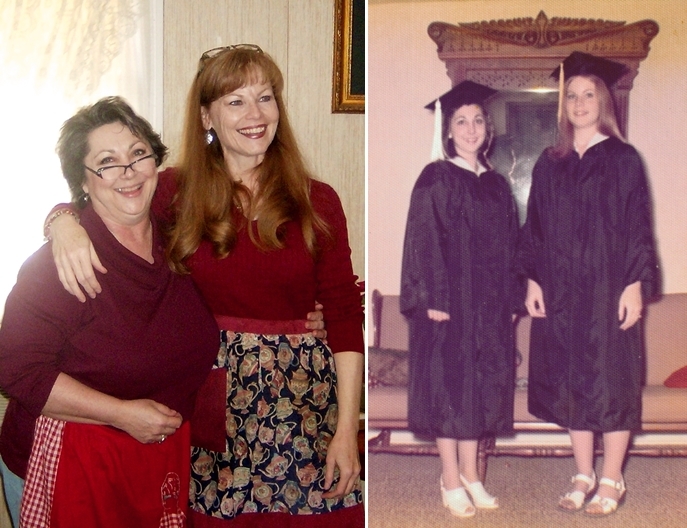 Now and then: in 1975, Sis was a college grad, and I was finishing high school. 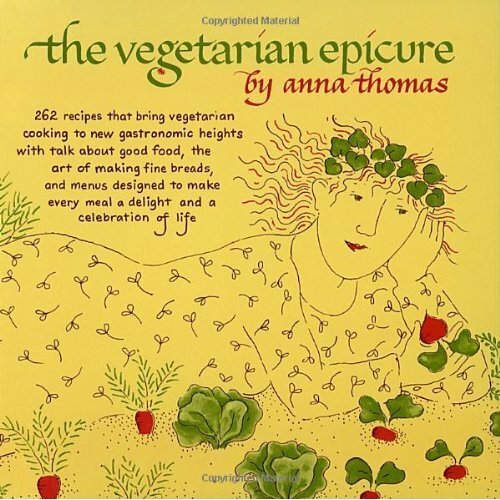 Around about that time, she gave me a wonderful cookbook, The Vegetarian Epicure by Anna Thomas, published in 1972. I immediately loved Ms. Thomas' Herb and Onion Bread, and made it for a long time. At some point I just kind of forgot about it...until the renewed popularity of the no-knead breads made me think of it again. I made it the other day, and it's just as I remembered: rustic, tender but with a little bit of chewiness to it, aromatic, and so flavorful. I baked it in a 1.5 quart Pyrex casserole dish. A few days later, I baked another batch in a loaf pan. This bread doesn't rise a whole lot, but it does make a nice-sized loaf. Preheat oven to 350 degrees. Spray a 9 X 5" loaf pan with cooking spray. Scald the milk and dissolve in it the sugar, salt, and butter; cool to lukewarm. In a large bowl, dissolve the yeast in the warm water. Add the cooled milk, flour, minced onion and herbs, and stir with a large wooden spoon. When the batter is smooth, cover the bowl with a towel and let the dough rise in a warm place until triple in bulk- about 45 minutes. Stir down and beat vigorously for a few minutes, then turn into greased bread pan. Let it stand in a warm place about 10 minutes before putting it into oven. Bake about an hour. Ms. Thomas notes, "This is the fastest yeast bread I know, and a delicious one. I like to bake it late in the day, to serve still warm with dinner. The aroma of herbs is the greatest appetizer you could devise." May have been shared at these great parties! Great recipe. THanks for sharing with us at In and Out of the Kitchen. Hi, Dawn- In and Out of the Kitchen is always fun! :) Thanks for the visit! thanks for sharing the recipe Joy - i am following you via email, thanks for following me! Thanks for the memories! We used to make this all the time in the 70`s. Although I don't know what it tastes like when it has completely cooled, it was make a loaf, eat a loaf while still warm. My mom found the recipe on the back of a yeast packet and the recipe just disappeared. I know what I am having tonight with my dinner. This has peaked my interest! :) Thank you for sharing! Hi! I'm a new follower from Let's Get Social. I also like the stories behind food and recipes. Thanks for the yummy-sounding recipe. Bet my senior mom would love it. Thanks for coming over from Let's Get Social Sunday! :) Hope you have a lovely week as well! Doughy delights are one of my weaknesses - looks so good! Thank you, JoAnn, I have quite a bread weakness myself! :) Thanks for stopping by! A friend wanted my recipe for this bread, which I have been making since the 70's myself--my copier isn't cooperating this morning, so...long story, but I have this recipe in The Vegetarian Epicure--which I purchased at my college book store, and another version in Sunset Cook Book of Breads--also bought while in college. Both of the books are falling apart! I have always used the Sunset version--it calls for 2 1/4 tsp. of butter and suggests dill, rosemary, or other herb as well as the onion. Also, you can turn the batter into a greased 8 or 9 in. pie or cake pan--don't try to spread it to fit the pan as it will spread on its own, bake @ 350 for 1 hour, then brush w/melted butter, sprinkle lightly w/ salt. Cool on rack. Is there any way you can post the recipe for pretzels from your Sunset Cook Book of Breads? My parents have misplaced their copy and they are dying to carry on the tradition of making pretzels on New Year's. There is a restaurant in Northampton, MA called The Green Bean. They make an herb and onion bread served with almond gravy. It is to die for! I am hoping that this is the same recipe. I am trying it out now. I hope you enjoyed the bread, Michele. Maybe, maybe, The Green Bean would share their recipe...restaurants do sometimes. :D Thank you for coming by! Thank you, thank you! Used to bake this back in the day, and had a sudden nostalgic urge for it. Felt like magic when I googled the V.E. recipe and your post popped up. Can't wait to try it again. 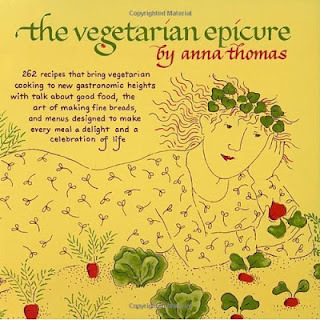 Both the V E books were my go-to cookbooks. During the blizzard of '78, I baked a loaf of French bread and made a pot of her wonderful soup au pistou and settled in for a blissful three day break from grad school. Kerry, I can almost see this! I can almost see as time stood blissfully still….from studies, from class, from anything stressful. You’re inside, all cozy, with delicious, homemade food. Thank you for sharing your wonderful memory with me!